Asana is the work management platform teams use to stay focused on the goals, projects, and daily tasks that grow business. Easily organize and plan workflows, projects, and more, so you can keep your team's work on schedule. Asana is a personal integration set up per user. This means it needs to be configured per user in AppSignal who want to use the Asana integration for AppSignal apps. First open Asana and go to your "Profile settings". Click on the "Manage Developer Apps" link to get your API token. Next, open your app on AppSignal.com. Open the "Integrations" page for the app. Click on "Configure" for the Asana integration. Paste your Asana API token in the "API token" field. Copy and paste the project ID of the Asana project you want to link in the "Project ID" field. Click the "create integration" button to create your Asana integration. The integration has now been created! 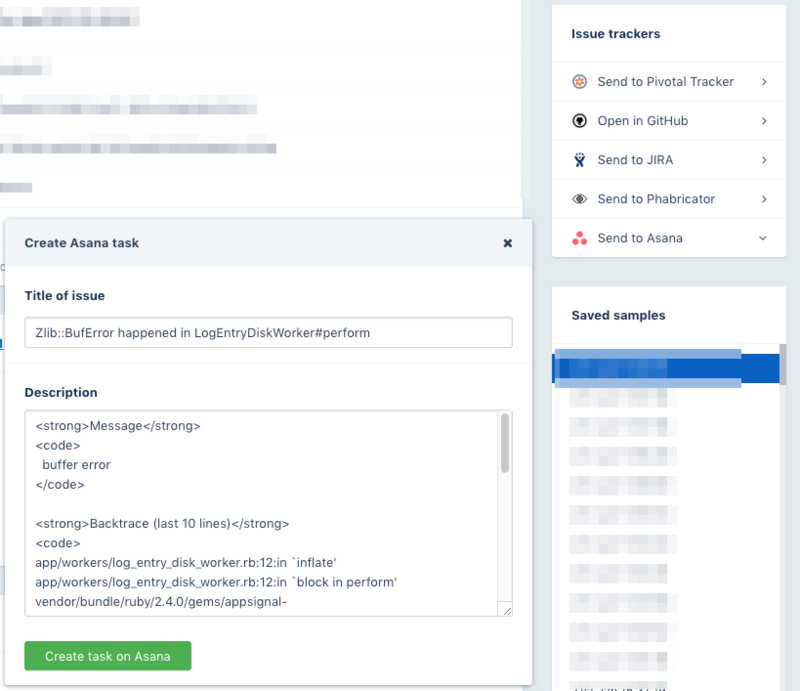 You can now send errors and performance issues to Asana from the incident details screen. If anything went wrong while validating the integration your will be prompted with the error message. Feel free contact us if you experience any problems while setting up this integration.